Chelsea Hamilton: Quote of the day. I Found this Quote and it couldn't be more relevant at the minute. I was born with CDH (congenital dislocation of the hip) so basically I was born with out a hip, My hip socket and head of femur hadn't developed properly. From being a baby iv had several operations, Bone grafts, Iv being on traction and Iv been in every type of plaster cast possible. 6 years ago I had to have an operation due to the head of femur dyeing, it had lost its blood supply so I had to have key hole surgery with lots of drilling (TMI) to encourage a blood supply back to the head of femur. Recently iv being having a lot of pain in my hip, its always hurt me but its worsened these past few months, probably worse then when I needed my operation 6 years ago. I'm waiting to hear Back from my GP with a appointment to see a hip specialists. 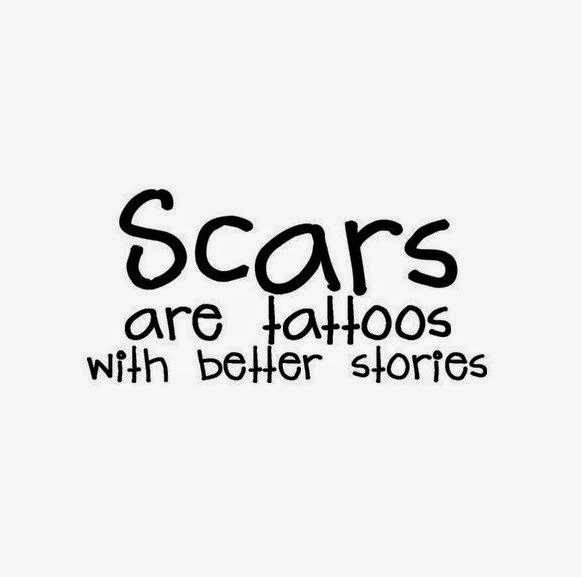 As you can imagine iv got a fair few scars and im proud of them all, as the quote suggests every scar has a storey, mine certainly do. If you'd like me to do a more in depth post about my hip storey, comment or message me and ill be more then willing to one, I may just do one any way in the near future.